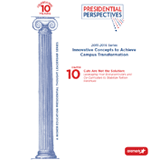 Presidential Perspectives is a higher education leadership series written by college presidents for college presidents. The 2015/2016 season represents the 10th year of this popular series. This year's theme is "Innovative Concepts to Achieve Campus Transformation" and focuses on how institutions are innovating and embracing change to transform themselves and the broader industry. Chapters are authored by notable presidents whose institutions are in the forefront of innovative practices in these areas. One chapter will be released each month, distributed electronically, and posted on this website. At the end of the series, the foreword and chapters will be bound into a keepsake book. To comment on this series, please click here to contact the Executive Editors or Publisher. Copyright © 2016. Aramark Higher Education.